You can play ... we guarantee it! If you've ever wanted to learn to play the piano or want to revisit the piano, this is for you! Amro's Recreational Music Making (RMM) is a fun, no-stress approach to learning the piano designed for adult beginners. What is RMM and how is it different? Recreational Music Making is based on the premise that learning to make music doesn't have to be a high pressure, academic pursuit — it can be a fun and relaxing, social activity. Lessons are in group format with between five and eight adults in a group. Lessons are one hour per week and the course is eight weeks. 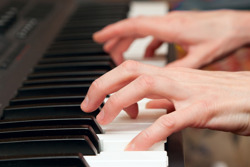 The goal is enjoyment — it's about having fun while learning to play piano. There's no pressure and no judgment. Progress at whatever rate you're comfortable with. At the end of the eight weeks, you will be able to play ... we guarantee it! And you can progress even further by taking more classes. Classes are forming now. To reserve your spot, call us at 901-323-8888 or send us an email. Ready to get started? 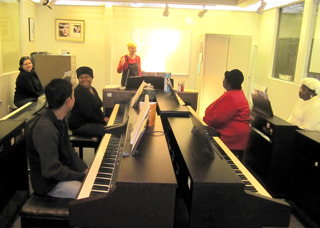 Check out our upcoming piano lessons schedule now! For more information or to reserve your spot, give us a call at 901-323-8888 or send us an email.